"Please tell us how you learned to stick and roll so good"
Don't be late to this professor's class, unless you're ready to dance. A Keiser University Tampa professor demands his students dance if they are late to his American Literature class. After being late once, Brandon Goderich came prepared this week to put on a show. 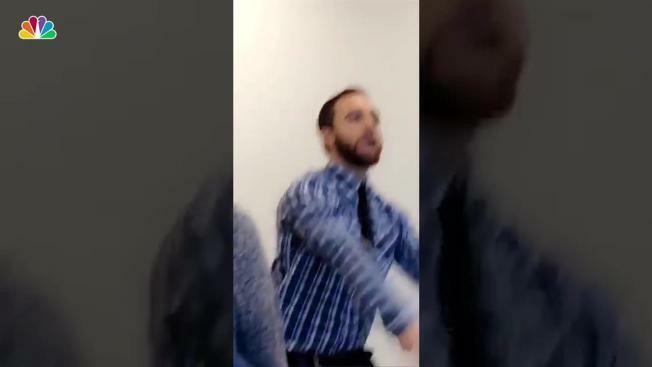 Video published to Twitter by a classmate with the handle @vvanee shows Goderich dropping it low in front of the class to Dj Chipman's "Stick It and Roll It." The video quickly went viral after being posted Tuesday. The very next day it had more than 8.7 million views. Twitter demanded to know who the student was, and Goderich made himself known to the online community, explaining that it was his second time late to class, and that he had brought along his own Bluetooth speaker and a play list to perform to. You should be late everyday so we can watch you get low. "Please tell us how you learned to stick and roll so good," one user asked. "Time, practice and YouTube videos to study...my hips don’t lie," Goderich replied. But not everyone was so impressed with the moves. "OK, the first time was cute. Now I'm just tired of you being late at this point. #Overload," @ImSoTSU tweeted. "My tuition and fees pays for an hour and 15 minute (or 50 min) course to better myself towards my career path: not, watch you dance for personal viral gain that gets us nowhere."